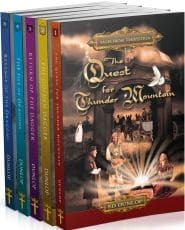 A classic collection of 36 beloved tales by David and Karen Mains that use allegory to reveal truths about the Kingdom of God. Updated by My Father’s World to include discussion questions. 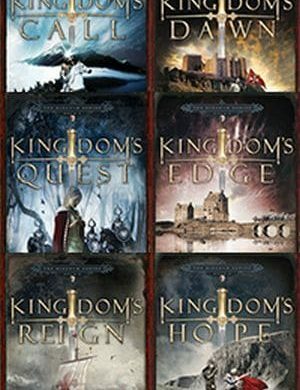 A classic collection of 36 beloved tales by David and Karen Mains that use allegory to reveal truths about the Kingdom of God. 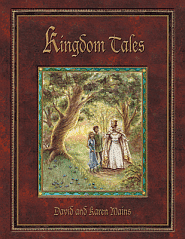 Kingdom Tales has been updated by My Father’s World to include discussion questions. In 36 stories (12 in each volume) these time-tested stories have captured the attention of children 8-19 for over four decades now. The trilogy begins with 12 stories centering on the adventures of two orphaned brothers. They escape a polluted city ruled by an evil enchanter to seek their exiled king in the place where trees grow. Twelve incidents in the Resistance against the Enchanter, in which residents of the Enchanted City are rescued by the King or his followers as they strive for the Restoration of the Kingdom. The residents of Bright City continue the struggle to subdue evil and to restore the King and his bride as their rulers. Dr. David R. Mains spent 12 years as Pastor of Circle Church in Chicago. Later he served 20 years as Director of The Chapel of the Air radio ministry, winning the 1995 National Religious Broadcasters Television Programmer of the Year award. He is author of over 20 books, including Gold Medallion Award winners. Through Mainstay Ministries Dr. Mains worked tirelessly to help pastors create effective, life-transforming Sunday sermons. Karen Mains, David’s wife, wrote the best-seller Open Heart, Open Home, a classic on the theology of Christian hospitality. This book sold over 600,000 copies and grew out of 12 years serving the inner city Chicago church with her husband. The book challenges believers to use hospitality as a means of bringing redemption to a broken society. Karen has already worked extensively in barrios and refugee camps in Central America, Southeast Asia, the Middle East and Africa. 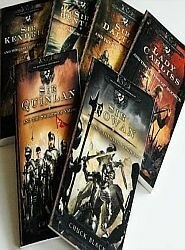 Then she worked alongside her husband to produce The Kingdom Tales Trilogy. The books were awarded the Gold Medallion by the Evangelical Press Association. These stories are frequently used by pastors in illustration or in dramatic form for churches and Christian schools. Karen also served on the Board of InterVarsity Christian Fellowship for eight years.